Patients who are confronted with a life-threatening disease may experience the limits of their existence. In many patients, this confrontation results in struggles and questions on an existential level, which can be discerned, but hardly separated, from questions that are primarily related to the psychosocial or physical dimension of human existence. 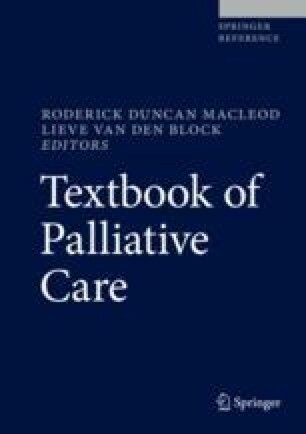 In this contribution an overview will be given on the state of the art of spiritual care in palliative care. After having given a definition of spirituality, we will focus on how to identify the aspect of spirituality, what a spiritual process and a spiritual crisis look like, what is needed for a conversation on spirituality, how spirituality can be measured and how effective spiritual interventions are, how one can deal with the hope of patients and families, how one can deal with intercultural issues, what conditions are needed for providing good spiritual care, and how to report and refer this dimension in palliative care. Candy B, Jones L, Varagunam M, Speck P, Tookman A, King M. Spiritual and religious interventions for well-being of adults in the terminal phase of disease. Cochrane Database Syst Rev. 2012;(5):CD007544. Available from: https://doi.org/10.1002/14651858.CD007544.pub2.